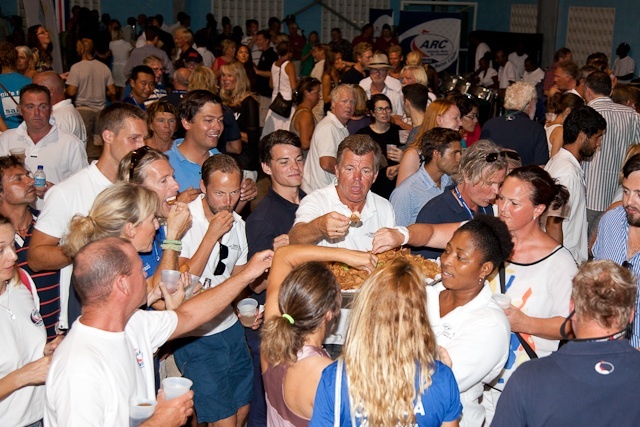 The 29th Atlantic Rally for Cruisers (ARC) wrapped up for another year on Saturday night with the traditional prize-giving party in Rodney Bay, Saint Lucia. More than 1,000 ARC sailors, their friends and families celebrated the safe and successful Atlantic crossing by more than 220 boats. The spirit of the ARC is the spirit of camaraderie and adventure, which makes every one of the 1,250 ARC sailors a winner, not just those on stage to receive awards. The evening, held at a new venue for 2014 at Beausejour Cricket Ground, provided a rousing end to the annual ARC rally, and a chance to recognise the achievements of the fastest and slowest, the oldest and youngest, and the couples and families that are so much a part of this cruising classic. Selene’s crew were recognized for the difficult feat of being the first boat across the finishing line with only two crew, and received the Double-Handed award. The young Swedish crew of Thalassa were awarded the Arch Marez Memorial Trophy for the best party boat. The Oldest Skipper went to Manfred on Albatros, certainly a deserving winner as he’s now completed more ARC rallies than anyone else. The Youngest Skipper award, went to 21-year-old Nicola Henderson on Hot Stuff, the only all-female crew this year. The winner on corrected time in the Cruising Division was also the oldest boat in the fleet, and was recognized for both accomplishments. Peter von Seestermühe, a beautiful 1936 Henry Gruber designed yawl and a regular ARC entrant, and received the Jimmy Cornell Trophy for their Overall win in the Cruising Division. Leopard by Finland was recognised for their record-breaking win in Racing Class A. They were narrowly edged out on corrected time for the Racing Division Overall by regular ARC entrant Scarlet Oyster, who corrected less than an hour faster than Leopard. Special prizes were awarded for web logs in several categories. The KAPRYS award for overcoming adversity at the start was awarded to Ross Applebey of Scarlet Oyster. Mr Bishop added: ‘I can safely say that the 2014 ARC was notable for the lack of at-sea incidents. The Spirit of the ARC award went to the Swedish yacht Take Off in honour of their overall enthusiasm, ingenuity at sea, and aggressive sailing despite having young children onboard. In tears, skipper Jorgen Wennberg and his family accepted the award. Jorgen then offered an impromptu speech, asking that Andrew Bishop and all of the Yellowshirt team take the stage to be recognized for their hard work in making the ARC such a successful event. Andrew and his team were offered a standing ovation, and with that, the evening came to a close. With the conclusion of ARC 2014, the focus now shifts on next year, which marks the 30th running of the rally that started in 1986. The boats and technology has certainly changed dramatically, but the ocean and skills needed to cross it safely have not. The 30th ARC planning is already underway with special events, prizes and details in the works..